I am finding myself having quite a bit of fun with Lorraine Anderson’s short stories. Aboard the Quaker City is another addition to my enjoyment. 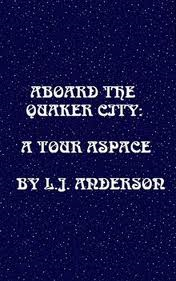 Aboard the Quaker City is basically about a guy who meets an ex while stuck on a cruise in space. It is completely absurd yet sweet. Anderson manages to compress imperialism and prejudice into 22 pages of unbelievability. Yet this is all stuff that I observe in pople almost every day. Granted, we do not have gills nor do we go on cruises around the galaxy (unless you count the Earth as a space ship), but we really are silly.